Material scientists from Zhejiang University, in Hangzhou have been successful in developing a carbon crosslinked polymer composed of polycaprolactone, or PCL as starting material. The new substance has transition temperatures of 70°C and 130°C for elasticity and plasticity, respectively; can fold into multiple different shapes, and snap between them hundreds of times with little sign of fatigue- one of the crucial points to be able to be used in real-world applications. It can change between different preset shapes under certain conditions, such as temperature. The heat-reactive polymer material not only retains the memory of its current shape but also learns new ones. Self-folding materials have been around for quite some time and all of them rely on the property of elasticity. 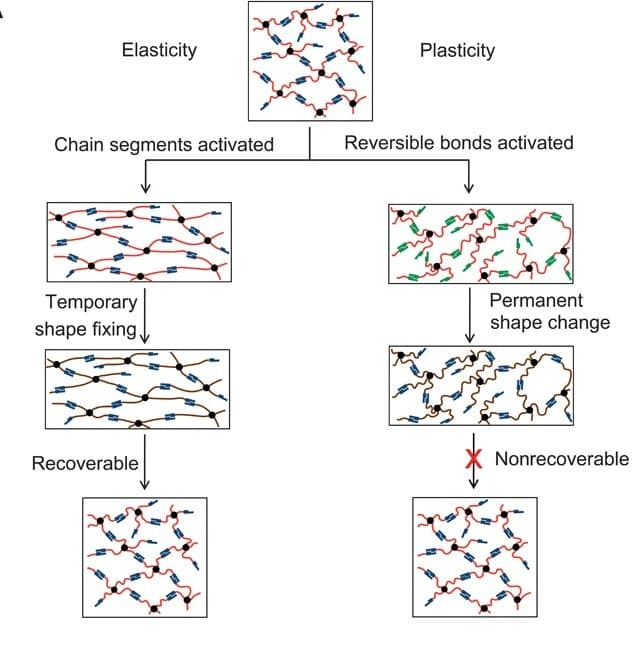 Though according to a paper published in the recent past if a change in material’s plasticity (that is its ability to be reshaped) is brought about; the shape memory could be stretched to hundreds or even thousands. To make material plastic as well as elastic scientists started with a known elastic material: crosslinked poly (caprolactone), or PCL and to impart the material plasticity, added a chemical called 1,5,7-triazabicyclo[4.4.0]dec-5-ene (TBD). The key for scientists was to combine PCL and TBD in such a way that the elastic and plastic temperatures were away far enough from each other for the material to switch cleanly between its different shapes. The team finally achieved the required critical temperature gap with the new substance having transition temperatures of 70°C (158ºF) and 130°C (266ºF) for elasticity and plasticity, respectively. The material can be used to make flexible medical equipment that can change shape in response to changes in body temperature and be used to make veins or heart brackets or on surgical equipment that can get rid of blood clot thrombosis, Zhao Qian from Zhejiang University was quoted as saying. The new material is definitely a giant leap forward in the field of shape-programmable systems and could have amazing future implications. The scientists' findings were published in Science Advances, an online journal from AAAS, the publisher of Science magazine.